Art “thought for the day”…because you’d really rather be thinking about art, right? ……..from Anne Lamott’s lovely book, Help, Thanks, Wow. Art makes it hard to ignore the truth, that Life explodes and blooms, consumes, rots and radiates and slithers; that eternity is really in a blade of grass. We see art in a moment in time, an instant, and this is holy. This entry was posted in Anne Lamott and tagged Anne Lamott on July 31, 2014 by terryvatrt. …and speaking of Kenojuak Ashevak…..
….most Canadians wouldn’t recognize her name, but many would be familiar with some of her artworks, especially the iconic The Enchanted Owl, which was featured on a Canada Post stamp. Kenojuak Ashevak was the first Inuit woman to make art at the Cape Dorset Print Shop. She began to sell her prints at the annual Cape Dorset print release in 1959. She received international recognition when she participated in the World’s Fair in Osada in 1970. She was prolific, and eventually worked in various forms of printmaking, as well as drawing and sculpture. Kenojuak Ashevak became a role model for other indigenous artists. She received numerous awards in her lifetime, including the Order of Canada, and the Governor General’s Award for Visual Art. 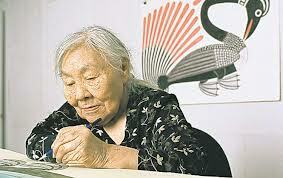 She was born in an igloo on Baffin Island in 1927, and died on January 7, 2013 in Cape Dorset. She left an amazing legacy. This entry was posted in Inuit Art, Kenoujouak Ashevak, Printing and tagged Cape Dorset, Kenojuak Ashevak on July 29, 2014 by terryvatrt. This gallery is like a kiwi fruit. It’s dull on the outside, and bursting with visual delights on the inside. 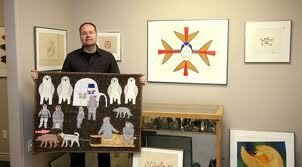 Richard Kroeker has collected a treasure trove of Inuit art. The space is bursting with sculpture (polar bear sculpture, anyone? ), prints, drawings and wall hangings. There is so much good work in this gallery that I’ll warn you now–don’t go unless you’re prepared to be awed and amazed…..and have plenty of time. The collection of work is extensive (I barely scratched the surface of the prints) and Richard has a wealth of information he is more than willing to share. All the ‘stars’ of Inuit print art are represented here: Jessie Oonark, Pudlo Pudlat, Simon Tookoome, Luke Anguhadluq and, joy of joys! the grande dame, Kenojuak Ashevak. A final warning: The quality of the artwork, and the ridiculously low prices may cause you to buy an artwork…..or three. This entry was posted in Inuit Art, Kenoujouak Ashevak, Printing, Sculpture and tagged Cape Dorset prints, Kenojuak Ashevak, Nunavut Gallery, Winnipeg on July 17, 2014 by terryvatrt. Of course, we at the Art Caravan knew this intuitively, but there’s new research from the University of Toronto to back this up. Ann Lukits writes in the Wall Street Journal : The study found that paintings activated areas of the brain involved in vision, pleasure, memory, recognition and emotions, in addition to systems that underlie the conscious processing of new information to give it meaning. Now we have evidence to support our love of art. Even more, it gives us license to exercise our art appreciating brains every day! Enjoy your exercise (!) looking at the work of these wonderful Winnipeg artists….. This entry was posted in Brain Research, Uncategorized and tagged Ann Lukits, the Wall Street Journal on July 9, 2014 by terryvatrt. ….from the Arctic Circle, to the Great Lake waters……Happy Birthday Canada! …from David Blackwood to Emily Carr……from Kenoujouak Ashevak to Lawren Harris…..
…..from Mary Pratt to B.C. Binning …..from Daphne Odjig to Walter Philips.…. There’s lots to celebrate. (I could go on, and on…..but it’s time to go outside and play!) Happy Canada Day. This entry was posted in B.C. Binning, Daphne Odjig, David Blackwood, Emily carr, Kenoujouak Ashevak, Lawren Harris, Mary Pratt, Walter J. Philips and tagged Canada Day, Daphne Odjig, David Blackwood on July 1, 2014 by terryvatrt.